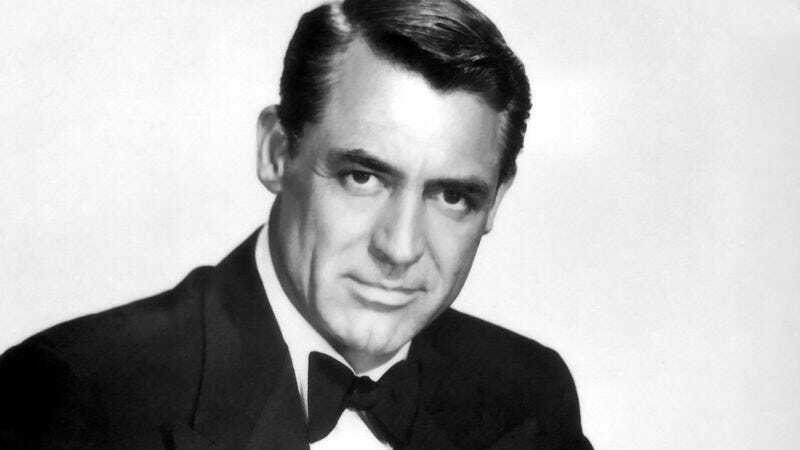 Why it’s daunting: Cary Grant was the quintessential movie star, and he had such a long career (30-plus years) that included a huge volume of films (more than 70). But his canon requires exploration for anyone interested in identifying which legends today’s stars are emulating as they hobnob on the red carpet or gallivant around their Italian villas [Cough—Clooney—Cough]. Grant is a symbol of the glimmering, halcyon days of Hollywood, when romantic movies ended, more often than not, in a mashed-lips clinch before fading to black. In this heralded era of romantic leading men, Grant was the most charming of all, with his mid-Atlantic English accent, omnipresent pocket square, and perpetual suntan (a literal depiction of tall, dark, and handsome). But what was exceptionally grand about Grant was his ability to tear loose from that classical style, embracing acrobatics and pratfalls, gamely diving into improvisation or heated dialogue, always seeming to poke a bit of fun at himself, but letting the audience know that he was in on the joke. His real trick was making this arresting screen persona look so effortless, in everything from screwball comedy to Hitchcock drama, when it was undoubtedly anything but. Why? Considering this is pretty much a perfect movie, it’s a logical start point for a foray into Grant’s career. The 1959 Alfred Hitchcock effort features one of the director’s favorite themes, as Grant plays the innocent man who somehow gets caught up in a complicated web of intrigue only a few minutes after the opening credits. So many of its scenes have become iconic: Grant getting chased by an airplane in a literal depiction of agoraphobia, the climactic chase up Mount Rushmore, the lighting of Eva Marie Saint’s cigarette as a major act of flirtation. But none of it would work if the audience doesn’t immediately root for the delightfully dashing hero, Roger Thornhill, as he tries to turn the tables on both sides conspiring against him. Next steps: After the gateway, it makes the most sense to move more chronologically, but Holiday is the ideal place to kick off this step. A 1938 film adaptation of the Phillip Barry play introduces Grant as Johnny Case, an ambitious and nonconformist young man who shakes up his blueblood fiancée’s stuffy family. Grant’s performance here is just sheer force of exuberant personality: ruffled hair, messed-up tie, double somersaults and back flip-flops (drawing from his acrobatic past). He spouts unconventional ideas about how to make his own way in the world while sparking with Katharine Hepburn, his sister-in-law-to-be. When Hepburn enthuses, “Spring came into this house today!”, it’s easy to see why. Offering the flip side of Holiday is one of Grant’s classic screwball comedies, Bringing Up Baby, also released in 1938. Here, Grant plays against his suave persona as a bespectacled paleontologist whose life gets turned upside down in a matter of days by screwy socialite Katharine Hepburn—whose Susan is one of the classic precursors to the Manic Pixie Dream Girl who rocks the world of a previously stuffy, dour male. Although a failure when it was released (Hepburn had to buy out her contract to avoid being cast next in Mother Carey’s Chickens), it is now considered a classic and one of Howard Hawks’ best films. (For anyone trying to get children interested in classic movies, this is a great one to start with; the madcap plot features two leopards, a dog, and a priceless dinosaur bone.) Bringing Up Baby inspired a string of imitators for decades afterward, from Peter Bogdanovich’s What’s Up, Doc? (worthy) to Madonna in Who’s That Girl (dear God, unworthy). Other sublime Grant romances from the black-and-white era include the aforementioned The Awful Truth, a turn toward the dramatic with In Name Only, and the superlative The Philadelphia Story. But 1939’s Only Angels Have Wings offers a hidden gem. Howard Hawks casts Grant as the head of an extremely small South American airline full of daredevil pilots who deliver mail throughout the Andes. Grant is so ruggedly attractive that showgirl Jean Arthur, on a quick layover from her steamship, decides to up and move to the port town after spending a single evening with him. Once Grant’s unrelenting magnetism has been well established, it’s finally time to watch His Girl Friday, the 1940 standard to which all bantering rom-coms still aspire. Grant is newspaper editor Walter Burns, again trying to win back an ex-wife, reporter Hildy (Rosalind Russell). The machine-gun fast dialogue can have a dizzying effect upon the first watch, as Grant orchestrates all number of machinations to get Hildy to come back to his newspaper (and to him). He hangs up on people in the middle of phone calls, throws reporters out of his office, and makes deals with pickpockets involving counterfeit money. The movie, based on Ben Hecht and Charles MacArthur’s play The Front Page, soon moves on to a death-row case, based on the press room in Chicago’s old Criminal Courts building. Even when he’s facing obstruction of justice charges, Grant is still completely in charge; after all, he’s handcuffed to Hildy, which is just what he wanted. By the 1940s, Cary Grant seemed to want to branch out from his string of light comedies, right around the time he started pairing up with Alfred Hitchcock. The director, who called Grant his favorite actor he ever worked with, brought out Grant’s dark menace like no one else ever had. Hitchcock’s Suspicion tried and failed to make Grant a heavy, but Grant’s pairing with Ingrid Bergman in the director’s Notorious makes up for it. Grant has co-star chemistry with pretty much everyone (noted exceptions to follow), but the screen absolutely smolders when he’s matched with Bergman. She’s a bad girl turned secret agent; he’s a fed who wants to believe she’s good, deep down. The one time she tries to make him dinner she burns it, but they’re both so into each other he can barely pick up the phone to check for messages. One of the hottest scenes ever filmed—at least of the ones featuring two clothed people, from the shoulders up, in black and white—it was also famous for teasing the censors and featuring what was considered the longest movie kissing scene at that time (three minutes). An Affair To Remember is probably the ultimate Cary Grant romance, as the 1957 film snuggles in securely between a comedy and a drama. Though the Tom Hanks-Meg Ryan homage Sleepless In Seattle does its best to ruin it, there is still no better choice for a Saturday afternoon weeper. Grant and Deborah Kerr fall in love on an ocean voyage, even though both are betrothed to other people. In Kerr, Grant has a match as classy and charming as he is, so their shipboard romance is a downright delight, which hopefully compensates for the sob-fest that follows. Viewers are encouraged to fast-forward past those gratuitously insufferable minutes of Kerr teaching her music students. Where not to start: Even a career as revered as Grant’s had some missteps. The aforementioned Suspicion suffers from a truly lifeless leading lady (Joan Fontaine won the Oscar for this?) and an obvious last-minute ending switch. Speaking of lifeless leading ladies, a common least-favorite Grant film is Kiss Them For Me, which tries to be a light-hearted depiction of sailors on leave and a potential star-maker for Jayne Mansfield. Unfortunately for Grant, he is paired not with the vivacious Mansfield, but with early supermodel Suzy Parker, who spends all of her screen time imitating a block of wood. Anyone who doesn’t have chemistry with Cary Grant just isn’t trying—or they’re embalmed. Also not worth it: I Was A Male War Bride (too cartoonish), Penny Serenade (too sappy), and Every Girl Should Be Married (too annoying). But why bother with these when there are so many other winners that haven’t even been mentioned? Instead try Arsenic And Old Lace (fun, but one of Grant’s personal least-favorite roles); Indiscreet (a lighter romance rematch with Bergman); To Catch A Thief (Hitchcock effort in which Grant plays a cat burglar romancing Grace Kelly); My Favorite Wife (which works as a kind of sequel to his first film with Dunne, The Awful Truth); or The Talk Of The Town (an intellectual love triangle with Jean Arthur and Ronald Colman). Even Grant’s second-tier movies are far better than most.